And now, Israel, what doth the LORD thy God require of thee, but to fear the LORD thy God, to walk in all his ways, and to love him, and to serve the LORD thy God with all thy heart and with all thy soul. You’ll notice Jesus never treats God like we do. That’s because, in Jesus, love and fear of God are in exquisite tension. ‘Love and fear the Lord.' It is very good advice on how to be intimate with God. Fear of the Lord does not mean fear of God’s judgment or fear of the wrath of God. (God’s judgment and wrath are to be welcomed.) Nor does fear of the Lord mean fear of being zapped by a lightning bolt when you do the wrong thing. Fear of the Lord is a spiritual attitude. It’s a sensitivity to and focus on God. Fear of the Lord asks the question, ‘Where am I in relation to God’, not ‘Where is God in relation to me’? It’s a feeler we put out to discern the boundaries God has created for us. It lets us know when we have overstepped those boundaries and spilled our egos out over God’s domain, and it hastens our attempts to mop up the mess. Fear of the Lord teaches us how God is God, and how we are not God. Just as Jesus is the perfect example of how love and fear of the Lord work together to sustain our right relationship with God, Adam and Eve illustrate what happens when fear of the Lord is absent. Their lack of fear of the Lord led them to overstep the boundaries God had set out for them. 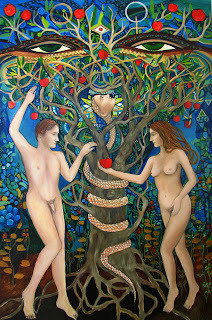 They knew not to eat of the fruit of the Tree of Knowledge, but they did not sense it. Their fear-of-the-Lord ‘feelers’ were weak, shriveled by an arrogance fuelled by lack of gratitude and unreflective hedonism. The only fear they could muster was fear of punishment and, as the story shows, that does not support relationship with God. Fortunately for them, and for us, God chooses to maintain the relationship even when we show preference for a juicy snack.